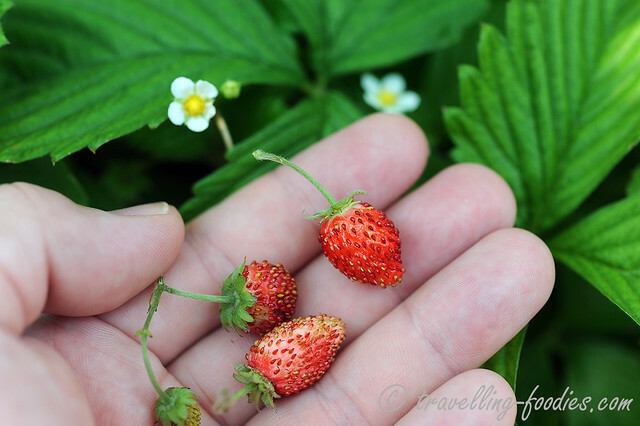 I remember most vividly chancing upon my first fraises des bois last year in Japan. So petite, yet so fragrant, no wonder these wild woodland strawberries which originated from Europe are much coveted in cuisine. Unfortunately, they are not widely cultivated. Then we came across the “tochiotome ichigo” in a farmer’s market. 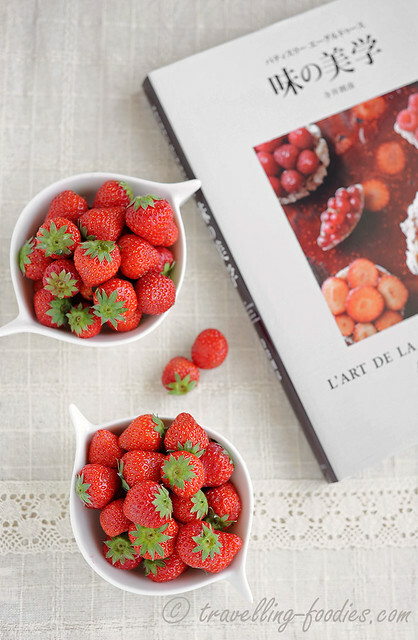 Not quite as small as fraises des bois but they are quite ideal for pastry making as well given their size. A cultivar created less than 10 years back, the name “tochiotome” was coined from “Tochigi” 栃木 and “Otome” to mean “Maiden from Tochigi” where they are being grown. Known for being sweet, they are supposedly very popular amongst the Japanese. Well, we most certainly love them as well! 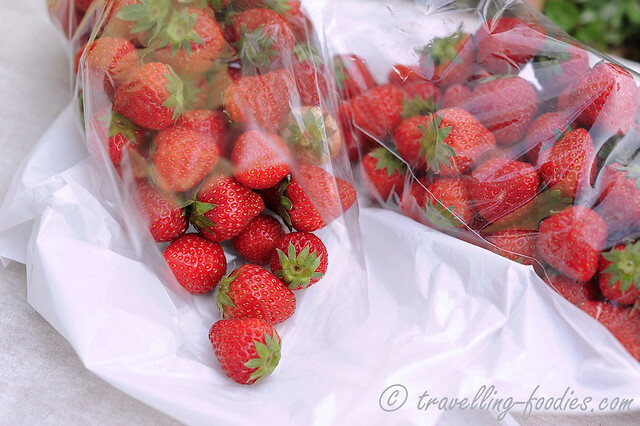 We bought two bags thinking of using them to make some pastries when we get home but as with most cases, strawberries don’t survive transportation well, particularly the Japanese varieties which are dubbed as the “soft type”, making them very prone to injuries and bruises. So in the end, I had to give up on the idea of making any pastries with those I brought back but ending up “jamming” them instead. Still packed with lots of flavour but just not looking really well anymore. Aoki’s creation is made up of 4 main components, i.e. 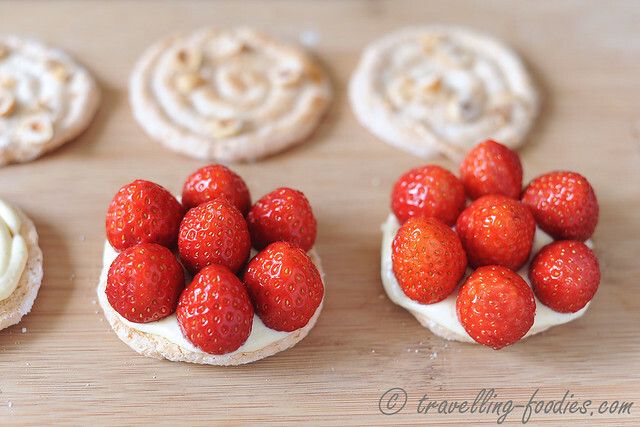 biscuit dacquoise au amandes et noisette, creme diplomate, fraisier fraiche and a teeny bit of coulis de framboises. 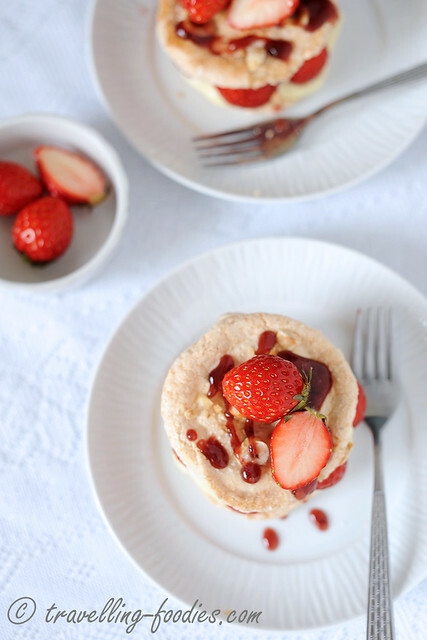 The first to prepare is of course the creme patissier component in the creme diplomate and was left overnight to cool down before whipping creme chantilly and combining the two for something which is rich and yet surprisingly light. A sliced vanilla pod was steeped in fresh full-fat milk before being used to make the creme patissier, just as how they ought to have been made traditionally. 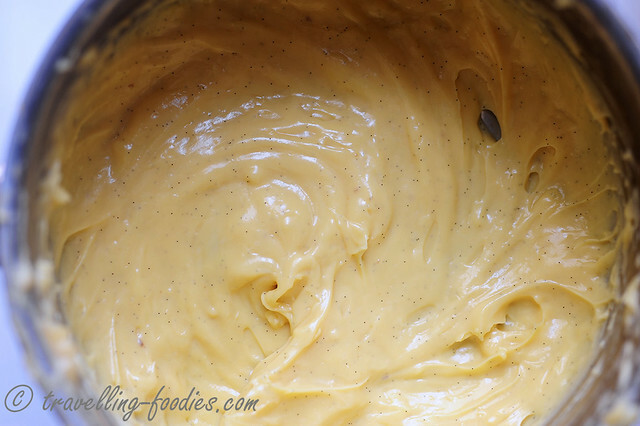 Vanilla extract is no go and it would darken the creme patissier. And don’t even talk about cheap vanilla essence. It has no place in proper french pastry making. 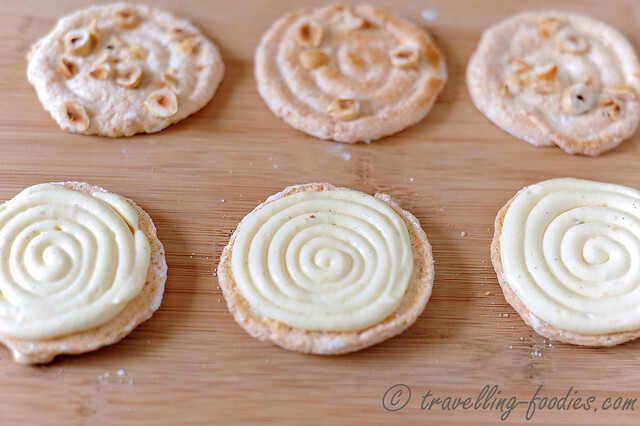 The preparation of biscuit dacquoise au amandes et noisette was also fairly straightforward. 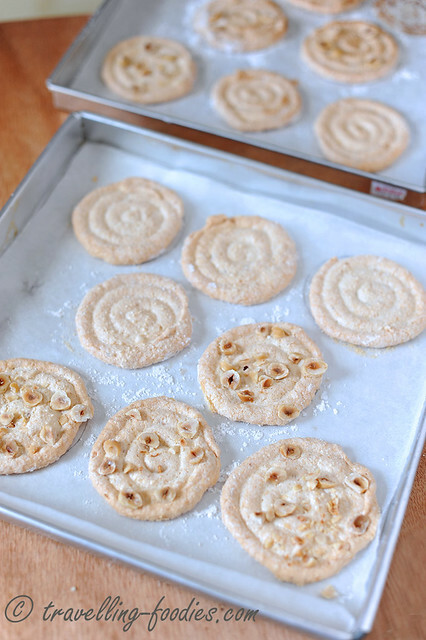 It involves first roasting almonds and hazelnuts at a relatively low oven temperature before blitzing them to form a powder. The nut powder is then sifted thoroughly with icing sugar to form a tant pour tant before being mixed together with a meringue francaise. Yes, prima facie this sounds very much like the macaronage for making macarons but (1) the proportions are different in terms of ingredients, (2) the batter for a dacquoise is not deflated unlike what one does to a macaron batter, and (3) dacquoise, being essentially nutty meringue cookies has no concern over feet or no feet unlike in macarons. A coulis des framboises was made as a drizzle and this is easily done by just blitzing fresh raspberries with icing sugar and then running the mixture through a fine wire sieve to remove the pips. To thicken the coulis, the mixture was then heated very slightly and added with some reconstituted gelatine before mixing everything well and chilling it in the fridge for later use. A simple creme chantilly was made by just whipping full-fat double cream until it gets nice peaks with small hooks at the ends. No icing sugar is added though as the creme patissier is already sweetened prior. The chilled creme patissier is then whisked quickly with the creme chantilly to form the creme diplomate. Will all the components made, what is left is to assemble the whole piece. With the dacquoise bases laid out, the creme diplomate is then piped over them in spirals… this reminds me of another of Aoki’s creations… his Tarte Chocolat au lait et Caramel Sale… oh well… that is another piece to do in the near future. Then the fresh strawberries are carefully laid over the creme diplomat. Oh yes, creme diplomate is also known as creme mousseline by some in case you are wondering. Each dacquoise disc should very nicely sit 7 of these petite tochiotome ichigos. 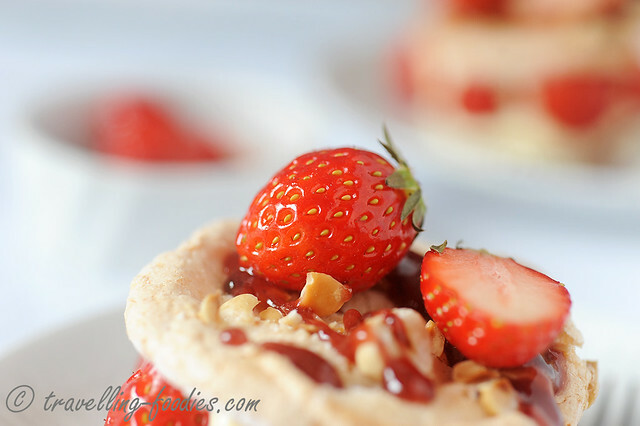 More cream diplomate was then piped over the top of the strawberries before covering with the other dacquoise disc, the one with chopped roasted hazelnuts embedded in them. Some coulis des framboises is then piped over the top and some more ichigos are added on top as embellishment. Voila! It is done! Sorry to say, I would not be providing the recipes for the components in this blog post. Another blogger well known for her re-constructions of creations from renowned Japanese patissiers purportedly got in trouble with the Japanese publishers like MOOK for openly posting their recipes in her blog, although I knew that she adapted some of those recipes and the instructions were probably entirely her own. She has since somewhat becoming lesser willing to share (or perhaps that was her nature to start with) but whichever the case, I don’t wish for myself to get into such trouble so I would have to apologise for the lack of detailed recipes. 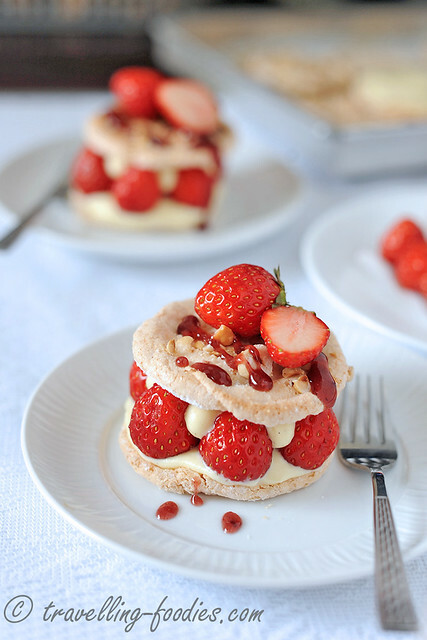 Anyway, it is not a difficult piece to recreate and there are plenty of recipes online for the individual components. Perhaps I should start a series on “French Pastry 101” to go through making the various components and readers can “work out the math” and assemble everything together… hmm… that’s something worth thinking over. 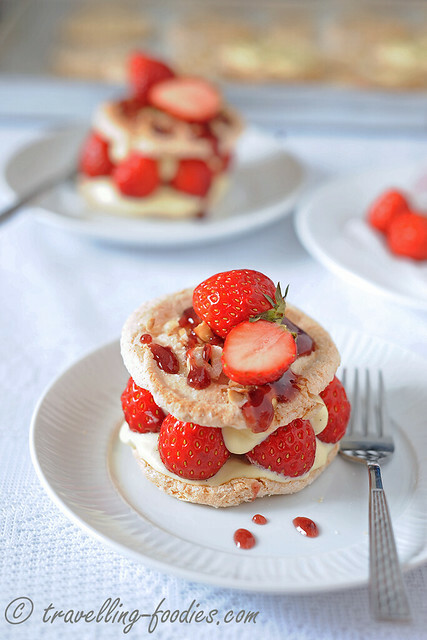 psst… actually if one bothers to search my blog, one could find the recipes for dacquoise, creme mousseline and coulis des framboises fairly easy. It is just a matter of putting them together. 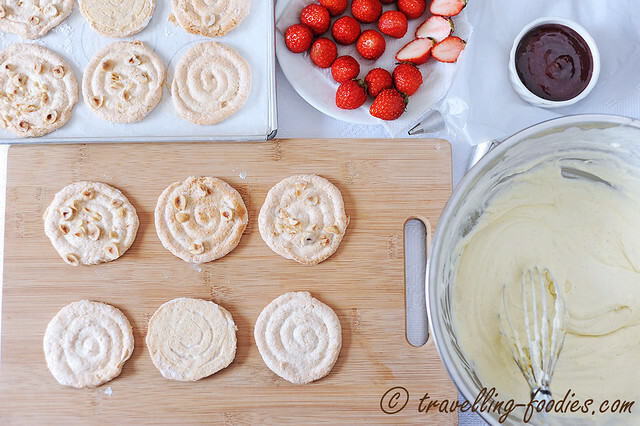 This entry was posted on April 15, 2015 by Alan (travellingfoodies). 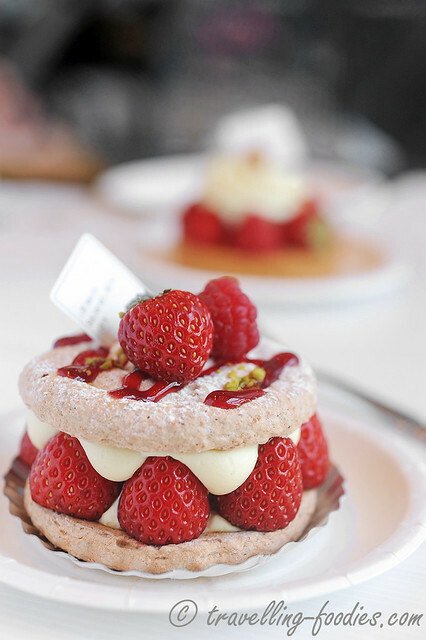 It was filed under Food, Simple Eats and was tagged with creme chantilly, creme diplomat, creme patissier, dacquoise, Fraisier, french pastry, Japan, pâtisserie, sadaharu aoki, spring, strawberries, tochiotome ichigo.